Casa Riera Ordeix: Traditional sausage and fuet from Vic. Where can you buy the best traditional salchichón and fuet from Vic? If we would have to choose a word defining what is Casa Riera Ordeix and what they give us, this would be tradition. 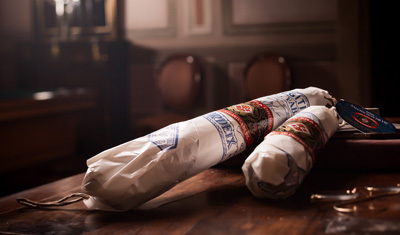 Casa Riera Ordeix is providing a unique quality in the world since 160 years ago with its salchichón of Vic. An exclusive product craftmade, using the same procedures were used 6 generations ago. In Vic's city centre and with the slogan Benvinguts a casa (Welcome home), Casa Riera Ordeix open its doors to their centenary wood drying places. There seems to be back in 1852. The most exclusive gastronomic establishments in the world succumbed to the excellent quality of its products. Harrods in London, Galeries Lafayette in Paris or El Corte Inglés in Spain are some good examples. So that, the salchichón of Vic de Casa Riera ordeix is considered the top of the best salchichon, unique in the world. 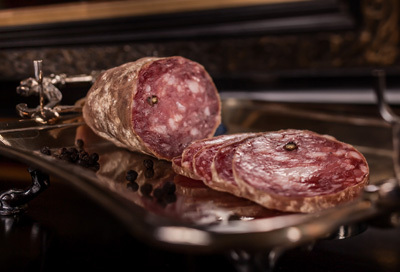 Salchichón de Vic of Casa Riera Ordeix is in the world gourmet elit, which has several prices and best gastronomy recognitions. 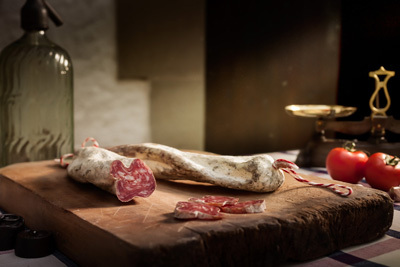 Since 2002, its Salchichón de Vic is a product protected with Protected Geografical Indication. This guarantees the product is 100% from Vic, which has been made there and has an exceptional quality, unique in Vic. Coq d'Or as best product of the year 2015. 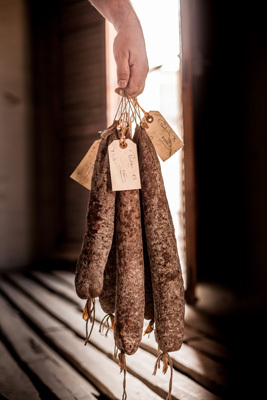 The excellence and quality of its salchichón and fuet of Vic have gone around the world, receiving awards from professionals from other countries. "Le Coq d'Or" is an award given by the French magazine Le Guide des Gourmands, which is a real eminence in the French cuisine and a referent worldwide. ICC Llonganissa of Vic. It guarantees the high quality of the product. Superior Taste Award 2009. Awards with worldwide recognition which give a proce to high quality gourmet products. Luxury Spain (Spanish Association of Luxury). Promote and empower exclusive and high quality Spanish products, nationally and internationally. FACE (Federation of Associations for Celiacs in Spain). They contribute to embetter the health, nutrition and welfere of celiac people. None of Casa Riera Ordeix products contain gluten. Catalonia Gourmet. It promotes the competitiveness of high range gastronomy catalonian products. How is done the best sausage of the world? It is done with lots of love, tradition and good raw material and ingredients. Nothing has changed since 1852 and the procedures still being the same ones. 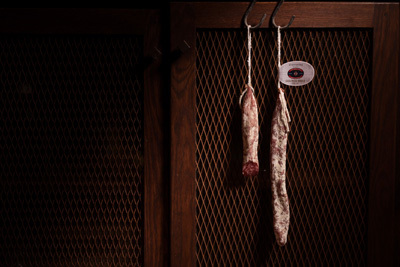 The sausage of Vic is made without hurrying and looking after each detail. Casa Riera Ordeix organises guided tours to its centenary drying places to see the care with which the products are made. It is a unique experience of sensations, in which the visitors will see the importance of the details, making the difference and giving quality and soul to the product. 1. Selection of the meat. The best meat of pigs from Casa Riera Ordeix farms is chosen. From the beginning, Casa Riera Ordeix guarantees the best quality of its raw materials. 2. Seasoning of the meat. As well as the drying, this is one of the main points for Casa Riera Ordeix products. All ingredients added while seasoning the meat are naturals to guarantee a unique flavour. So that, when you eat a piece of saussage of Vic, you feel its natural flavour to enjoy a flavour free of artificial products and sulphates. Sausage of Vic Casa Riera Ordeix is far the healthiest sausage. The seasoning used is artificial preservatives free. The ingredients are the same since decades ago: sea salt and grain and ground black pepper, gluten and lactose free. Anything else is needed to get a high quality product and its sausage is a good example of it. Once the meat has been carefully standed and seasoned, it is stuffed in the natural intestine and ,then, it is tied using a cotton cord. Its color will allow us to identify and differentiate each product. This is the main step in the process so it has the real essence of the brand. Getting into the century drying places of Casa Riera Ordeix is like travelling in time 6 generations back to 1852. The dryiers are made with solid wood, like the ones traditionally used, as well as the procedures. 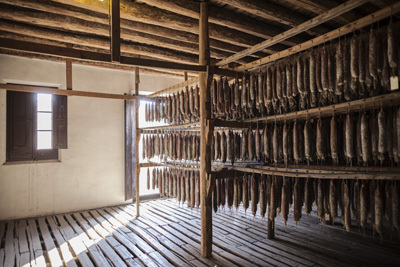 In the wood beams the sausages are hanged and the windows are manually opened and closed to control temperature and humidity. During the drying time, the sausages are carefully gotten down and brushed at least twice. The secret of its products succed: a traditional drying only done by Casa Riera Ordeix. While the rest of the companies have been mechanised and industrialised, Casa Riera Ordeix still being loyal to its origins and tradition. So that, getting to provide us the best sausage of Vic in the world and gourmet's elite. The products are in the dryiers a minimum of 90 days and a maximum of 180 days. Its production is limited, so it is conditioned by weather conditions of each moment to guarantee the most exceptional quality of its products. The bandle seems something insignificant at first, but in Casa Riera Ordeix has a great importance. All its products are manually wrapped, like it was used to be done. The paper used indicates us this is the best sausage of the world, unique at its type. 4. Where can you buy the best traditional salchichón and fuet from Vic? At Jamonarium, we are always opting for gourmet quality products to offer the best quality possible and making the eating experience unique. So that, you will find on our site the best two products of Casa Riera Ordeix: the sausage of Vic and the fuet of Vic. Unique in the world and naturally and traditionally made, following the same procedures used in 1852. Le Coq d'Or 2015 Award. Distinguished PGI since 2002. Its presentation in an elelegant wood box, makes this product in the perfect gift for anyone who enjoys trying the most exclusive products of Spain's gastronomy. It is one of the most classic products of the Catalonian and Spanish gastronomy. Le Coq d'Or 2015 Award.